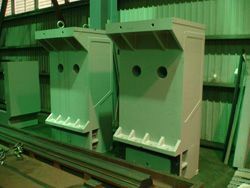 The machine base, columns, cross beam, worktable, slide ways, head and all cast parts are of top grade Meehanite Cast Iron and subjected to annealing, to prevent internal stress and deformation. The Z-axis is built with a rigid cast iron box way construction reinforced with optimized internal rib support. 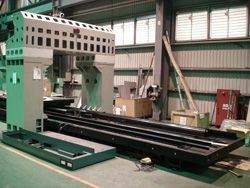 It is balanced with Nitrogen in conjunction with dual pneumatic cylinders cushioning of the headstock for automatic balancing during vertical motion. 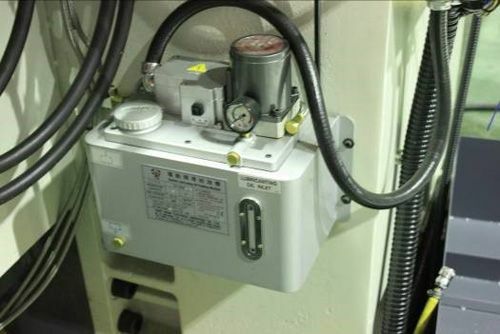 Even in a sudden power failure, the head maintains exact positioning without damage to the tools and work piece. 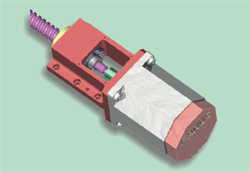 The multi-speed spindle adopts a top quality German-built ZF helical planetary gearbox. 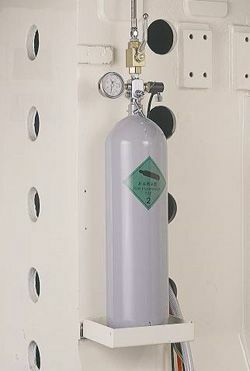 Fully sealed immersion type lubrication, with an oil-chiller, keeps the machine running cool. 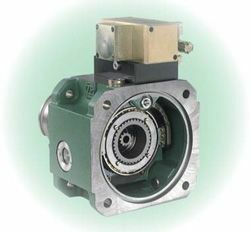 The ZF gearbox provides high efficiency with high torque, low noise, and long service life. 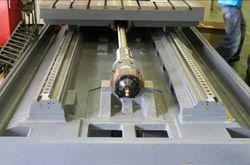 The spindle is housed in a box type structure and rotates on high precision taper roller bearings allowing for all types of heavy-duty cutting without vibration. 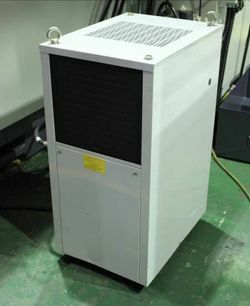 Tested and adjusted for dynamic balancing, the spindle incorporates a forced circulatory oil chiller to minimize temperature rise and ensure the long term accuracy and service life. 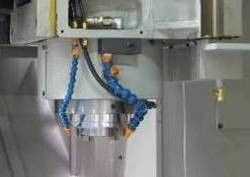 An external high capacity coolant system further protects against thermal deformation during heavy cutting at high speeds. 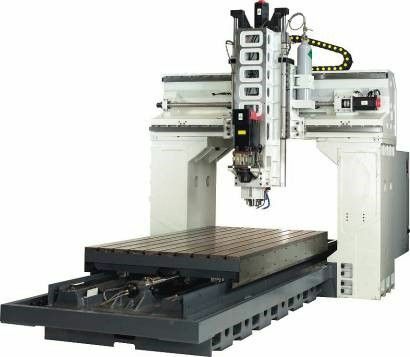 Spindle nose to Z-axis slide way distance is less than 300mm, providing an excellent design for increased rigidity. Ultra wide ladder type cross beam with dual LM linear guide ways are designed to handle increased inertia. 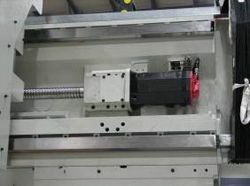 This design ensures rigidity and stability of the spindle and prevents tilting, particularly during heavy duty cutting. 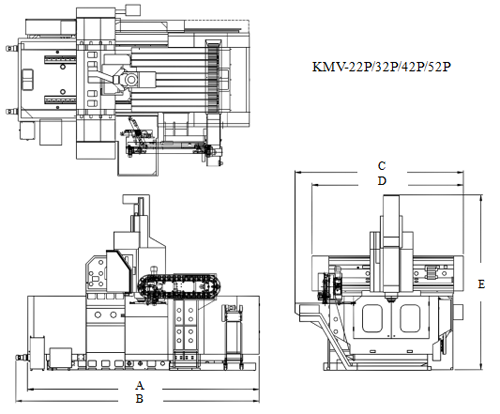 Both X and Y-axes are equipped with high precision heavy duty LM guide ways. 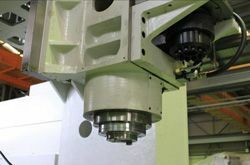 This design makes for more accurate movement and easier precision control during machining mid sized to large work pieces. 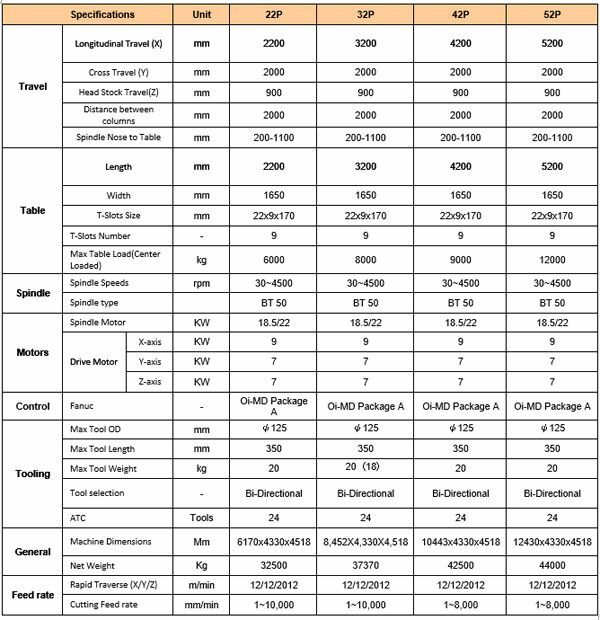 Both the table and base of the machine efficiently distribute heavy loads via A type structural design. 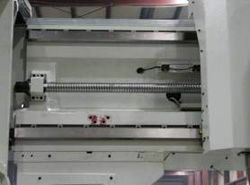 The column is cross-rib reinforced to minimize the deformation during high torque conditions. 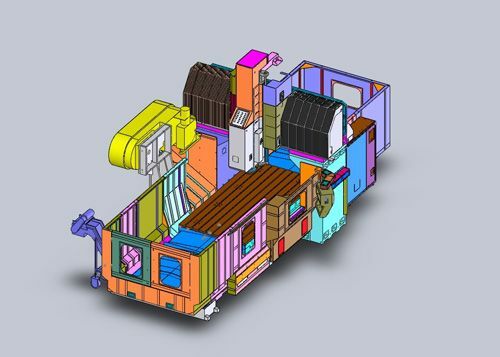 All the major castings are of rational design and of superior grade Meehanite to guarantee rigidity, precision, and long term service life. 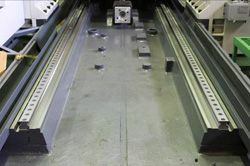 Precision scraped Turcites coated on slideways and lubricant pressure fed at a volumetric ratio provide an uniform film of lubricant on all contact surfaces which eliminates both drifting at high speed traverse and slow acceleration during machining. 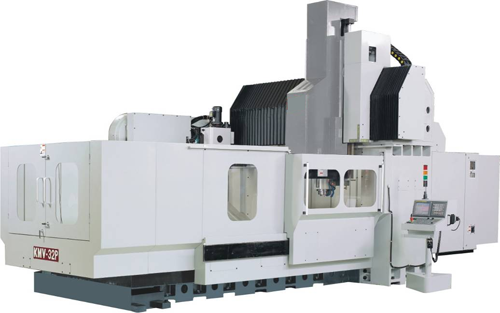 All three axes employ high precision ball screws and servomotors with a direct drive transmission, and each ball screw with a dual pretension nut system and preloaded support at both ends for superior rigidity. 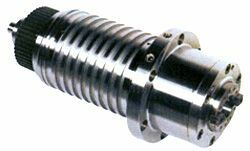 The spindle and ball screws at all three axes are cooled by an oil chiller, preventing heat deformation, extending the life of spindle bearings and guaranteeing accuracy at each axis. 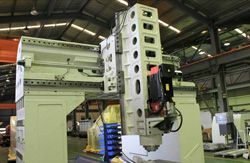 The Fanuc 0iMB, 8.4” Color Screen control panel is ergonomically positioned, so the operators get the most advantageous viewpoint during operation.